Chris Carter is one of those crime writers that has a big online following, and really ardent fans. Years ago I read his debut THE CRUCIFIX KILLER, and was left with mixed feelings, like he had all the puzzle pieces for a good crime story but stylistically his debut didn't quite gel, showing plenty of promise but also coming across a little cliched or derivative of many other writers. In a way, it was like a band still trying to find its own unique sound, while playing covers of others. Or early-in-the-season American Idol contestant still looking for their own distinct voice or artistry. At the same time, I understand I read a lot more crime fiction than most, as well as judging awards etc, so may have a different perspective to casual crime readers, eg things I think are cliched, clunky, or derivative and pull me out of the story flow may not bother or be noticed by others. 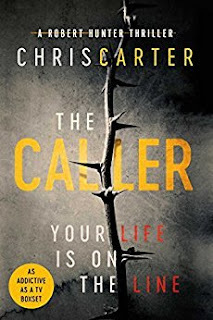 Recently, I decided to give Chris Carter another go, after many online recommendations from big fans of his, and read THE CALLER, his latest bestseller. I was hopeful. What I found was a good solid crime read that I really wanted to love, but just kinda thought was okay. Carter has a cinematic storytelling style, packed with plenty of action and twisting plots. THE CALLER is vivid at times, and the page whir. He creates characters with plenty of traits or abilities that on the surface should be very interesting. But for whatever reason it all just feels a bit thin to me. Things had improved a little since his debut, but many of the flaws in that book were still present. I'm trying to nail down exactly what it is about Carter's writing that just doesn't click for me (NB it clicks for many, many other readers), but in the end maybe it's just the sense that I've seen similar things done so much better by many other authors, and that the books feel very 'author hand' rather than particularly authentic or organic. I find myself rolling my eyes too often, or feeling like it's a quite-exciting film where you're still glancing at your watch in the cinema now and then. Not wholly absorbed, entranced, or so caught up that you lose track of time. Carter is particularly good with pace, and tells fast, twisting stories - which I think mitigates or masks the various flaws for many readers. The story blazes by. But for me there's just a feeling that there's 'something missing', some heart or character depth or emotion or ... something. Overall, I'm glad I tried Carter's Robert Hunter series again. It was a solid, fast crime read. For whatever reason (I've tried to elucidate above, perhaps poorly), it's just one of those 'not for me' series so far. But it is one that a lot of other readers like. Some reviewers I respect really love it, and he sells tonnes. So give it a go and make up your own mind. We all like different things. I might even give the series another go myself, at some stage.